Day 2 of the SuperValu Sutton Inter-Schools Sailing – With a building breeze through Sunday as forecast, the Race Management decision on Saturday to get 3 races in proved a good one. With tide dictating the start time, realistically one race for both Optimist and the Mixed Fleets was about as much as could be expected. And so it proved. With wind of 14 knots but gusting to over 20 knots a single race was managed but probably neither fleet could have taken a second. In the Mixed Fleet a tremendous battle for Individual honours ensued between overnight leader Daniel Hopkins (Mount Temple) in a Laser Radial and Adam Walsh (Patrician Secondary, Newbridge) in a Laser 4.7. With one point separating the pair, boat handling and maximising boat speed against the PY clock was going to be the key. In the end Adam prevailed and did enough to pip last years winner. The Mixed Team event is another battle altogether. The key to a successful Team event is to have 2 good scoring boats in each race and this is where the Mirrors excel. While they may not have the pace of the Lasers a well sailed Mirror competes very well on PY over a series. Top Mirror for the event was Athlone Community College Lughaidh Croasdell who finished as 3rd Individual. However the overall victors and winners of the Conor Nolan Memorial were Marist College Athlone, who combined a well sailed Laser Radial and 2 Mirrors to pip Athlone Community College to the title for the very first time. In only his second racing event Sutton Dinghy Club sailor Ciaran Durnford brought his Laser 4.7 home when many others retired and allied with Daniel Hopkins 2nd overall, pushed Mount Temple up into a well deserved 3rd place team finish. Click below for Final results. 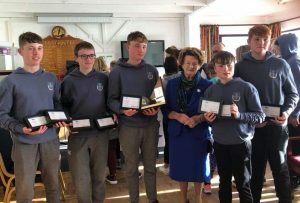 In the Optimist Fleet, Belvedere College dominated proceedings taking the Team Prize and 3 of the top 5 individual prices. Luke Turvey took the Institute of Education Trophy as leading sailor combining with his brother Hugh to take Team honours. They pipped the second Belvedere team that included Evan Darby and last years top sailor Johnny Flynn. Lucia Cullen from Holy Child Killiney took 4th Individual with local St Fintan HS, Sutton sailor Fiachra Farrelley taking 5th. Click below for Final results.